Solar Voltaics is dedicated to providing domestic and commercial customers with a professional turnkey solution for the supply of solar photovoltaic systems. Solar Voltaics is a solar panel installation company specialising in the commercial, public sector and agricultural markets. We provide a professional and personal service for the supply of solar photovoltaic systems. Our mission is to make sure that customers understand how solar photovoltaics (PV) can work for them. Every project and customer is unique and we aim to be as informative to our clients as possible. We explain every aspect of a project to them, from initial planning to final commissioning. Detailed projections are provided showing exactly how much energy they could generate on their property. We calculate the financial benefits they can expect from a solar installation designed to their specific needs and budget. Are Solar Panels still worth investing in? Businesses and Councils have really embraced solar energy in recent years and are receiving excellent results from their investments in solar. Now that the government has reduced the level of subsidy payments (see latest Feed In Tariffs here), some people believe they may have missed the boat. They wonder if it is still financially viable to install a solar energy system. The answer though is definitely yes. For many businesses the main advantage of installing solar panels is the energy savings they can make. The higher the energy consumption of a building then the more likely it is that a solar panels will be a viable proposition for you. For high energy users most of the energy generated by the solar panels will be used on site. This will reduce bills more than a site that uses much less electricity. We are finding that even with the new FIT rates that came into effect last year customers can still achieve a payback within 8-10 years. That doesn’t include the many other benefits such as the reduction in CO2 emissions, a lower carbon footprint and helping to reduce airborne pollution. Call us today on 023 92 006161 for a friendly chat and see how we can help you. 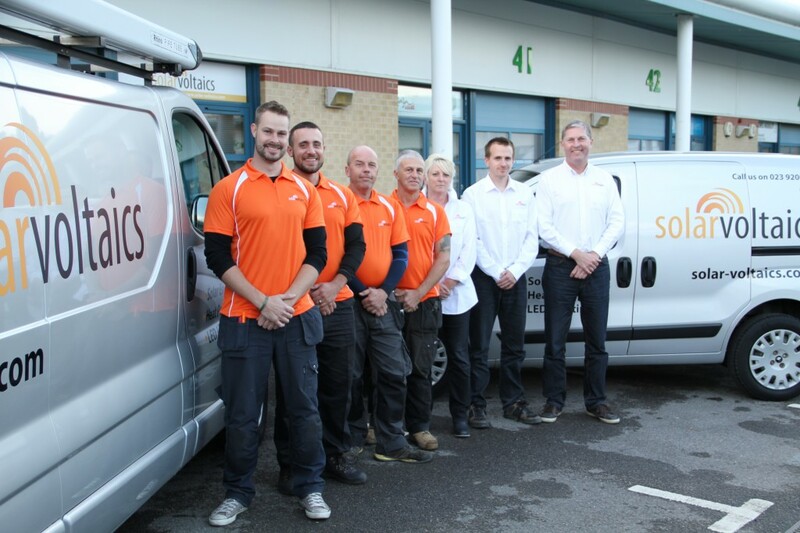 The Solar Voltaics team: led by Mike Turner, a professional choice for commercial solar installation projects. We have recently undertaken projects for Portsmouth City Council, Mercedes-Benz South West and we are in Hampshire County Council’s Register of Approved Suppliers for PV. In addition to the installation of solar energy, many of our previous clients have asked us about electric vehicle charging and battery storage systems. Whilst we don’t plan to make electric cars ourselves, we have now added ev charge points to our portfolio of products. We will be launching a new web site for these soon. We will be utilising our experience in solar energy and grid connections to offer commercial scale EV charge point facilities. In addition we will offer residential EV charge points at a subsidised rate through our OLEV accreditation. We are currently accredited to install charge points from Rolec and NewMotion. We are also now able to offer battery storage systems from a variety of top brand manufacturers. Most of these have developed their technology in the automotive electric vehicle market, which has the most demanding reliability and safety requirements. Call now on 023 9200 6161 and find out how we can reduce your costs and help you become greener. "Every part of the process was a pleasure. We are planning to have further installations this year." Great customer service from start to finish, no hard sell and listened to what the customer wanted from the beginning. Very friendly and efficient. There was no unwanted selling up. A proficient site visit was followed up with a professional quote. The system was installed efficiently by a tidy and friendly team of installers. It was all managed from the house energy performance certificate to the feed in tariff application without a hitch. Everyone I had contact with was friendly, helpful and knowledgeable, the installation was performed in a timely manner with little disruption and the work areas left tidy and clean. Recommended by an acquaintance who had used them. Professional and friendly approach throughout, from initial survey to post-install documentation. Quick, efficient and clean installation. I found the supplier knowledgeable & professional. The installation team were very professional and efficient. they were tidy and carried out a first class job. The quote from Solar Voltaics was not the cheapest we had received but we decided to go with them because of their professionalism. We are very satisfied with both the system and their service. Many thanks indeed for the excellent solar panel system you recently installed. The whole service was smooth and painless from start to finish and I commend Ralph and Owen for their skilled and professional installation. It has been a pleasure doing business with you and we look forward to reaping the rewards of this investment over the years to come. Come on Sun! A very prompt appointment to prepare quotation which was submitted within 2 days of visit. Well presented Quotation which required little in the way of any clarifications. Installation arranged very promptly following acceptance of Quotation and installation was carried out very efficiently over a 2 day period with scaffolding removed the day following completion of Installation. Very pleasant Installation team who I would thoroughly recommend. Installation Manual delivered within 2days of completion of Installation and assistance given to make application for Feed In Tariff an easy matter. I am delighted with your PV installation which has withstood the recent storms and generated more kW than were expected. I was delighted with the whole service from Solar Voltaics- from quotation to installation and for the past year’s performance. For me this was a good investment and I would and have recommended this company to anyone considering solar panels. To date we have been very pleased with the performance of our installation, which has exceeded our initial expectations so far. We are happy to recommend your company to prospective customers. Excellent install and has worked a dream with no issues. I had a 4Kw solar system installed on the 12th January 2012 and has produced over 4000Kw in under a year. A very good investment. The installers were friendly and courteous. Workmanship excellent and also clean and tidy. A truly professional company. I highly recommend them. A quick note to say that Dan and Owen completed the installation yesterday. It was a pleasure to have them here as they were very professional, did a great job and were very courteous and pleasant to be with - so very well done. I was absolutely delighted with the whole installation and the way everything was done. Thank you. Thought you would like to know - made £1100 in the first 6 months plus the electricity we saved. Not bad on a 3.5 KW system.